A team in Canada has made a device that could be implanted behind the eye to release drugs on demand to treat retinal damage caused by diabetes. Diabetic retinopathy can lead to blindness. A current treatment is laser therapy, which is destructive and results in side effects, such as diminished side and night vision, and unwanted laser burns. Another therapy is to administer antiproliferative drugs, such as docetaxel (normally a cancer drug), but the compounds clear from the blood quickly, so high doses are needed to produce the desired effect, which increases toxicity to other tissues. Mu Chiao and colleagues from the University of British Columbia in Vancouver have made a device to be implanted behind the eye that releases drugs when triggered by an external magnet. This means that the device doesn't need a battery and lower doses can be used. Implantable devices have been made before but drug release is done by diffusion and the release rates can't be controlled, which is a problem if the dosage rate needs to be adjusted when a patient's condition changes. The device is loaded with a drug then sealed with a polydimethylsiloxane membrane. 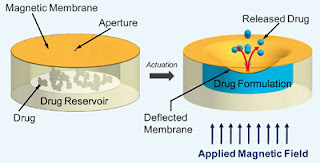 Applying a magnetic field causes the membrane to deform, triggering the release of the drug. The team made the device from a reservoir loaded with the drug, sealed by an elastic magnetic polydimethylsiloxane membrane. Applying a magnetic field causes the membrane to deform, triggering the release of the drug. The team loaded the device with docetaxel at a dosage suitable for treating diabetic retinopathy over 35 days and found that background leakage of the drug was negligible. They also monitored the drug's biological activity over time by testing it against two cell lines, including prostate cancer cells. They found that they were able to achieve reproducible release rates and the docetaxel retained its pharmacological efficacy for more than two months in the device. 'The device is intended to improve the quality of life for patients suffering from chronic diseases,' says Chiao whose motivation was personal as he has family members that have diabetic retinopathy. Chiao hopes to pin down the exact medical applications for the device so that he can tailor the mechanical design to particular diseases. However, he does envisage challenges ahead, involving biocompatibility, performance optimisation and degree of controllability.